STRASBOURG (Reuters) - The European Union parliament will decide on Tuesday whether Hungarian Prime Minister Viktor Orban should be punished for undercutting democracy, an unprecedented vote highlighting how the bloc is struggling with a populist and nationalist tide. It is a unclear however whether the 750-strong legislature can muster the two-thirds majority needed to pass the motion finding that Hungary has persistently breached the EU core values under Orban. An immigration hard-liner, Orban has put pressure on courts, media and non-government groups since coming to power in 2010. Though the EU has often protested, it has largely failed to stop what his critics decry as his growing authoritarian drive. "Pro-migration representatives hold majority in the European Parliament. They are now preparing revenge against Hungary because the Hungarians decided they will not become an immigration country," Orban said before arriving in Strasbourg. "Do you really believe that any country...can survive on its own, without help, without the solidarity and cooperation of other countries?," he told the lawmakers. "There can be no future for Europe like that." But the case put forward by liberals, EU enthusiasts and many others in the bloc is much broader. Even Orban's fellow migration hard-liner, Austria's Chancellor Sebastian Kurz, surprised by announcing plans to vote against Budapest. 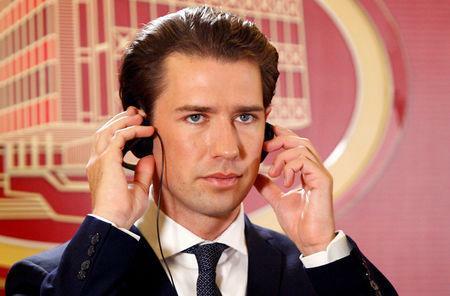 "We believe that there can be no compromises on the rule of law and democracy," Kurz told ORF television. If the so-called Article 7 procedure passes, it would set in motion a process that could lead to sanctions such as a suspension of Hungary's voting rights in the EU. Kurz's party is in the same conservative bloc in the European Parliament as Orban's. They form the biggest faction in the European Parliament, the European People's Party (EPP), where lawmakers with German Chancellor Angela Merkel also sit. The EPP membership has muted EU reaction to Orban's policies over the years and the big question mark is how the group's 217 members will act when the vote is held on Wednesday. It will also be a test for Merkel ally and EPP head Manfred Weber, who announced his bid to become the new head of the bloc's executive European Commission next year. Taking a stance on Orban comes as his first big challenge. Orban himself was due to address the parliament on Tuesday. Italy's anti-immigration Interior Minister Matteo Salvini, whose League party has six lawmakers in the European body, said separately: "We will vote in defense of Orban." These political divisions show how difficult it is for the EU to discipline those members that flout its central tenets and take a eurosceptic course. Poland's ruling Law and Justice party, which stands accused of dismantling an independent judiciary at home, will also defend Orban with the 73 votes of its eurosceptic group. Eventually, it would be up to the other 27 EU states to decide on what to do with Hungary should the parliament's first-ever such vote pass. They would need unanimity to sanction Orban, making any tough punishment highly unlikely.